The two peaks are easy to explain: paperbacks and hardcovers, respectively. The long right tail is pretty much exclusively made up of technical books. I’d suspect that for those who read a lot but don’t buy technical books, the bimodality holds up but there’s a lot less skewness. 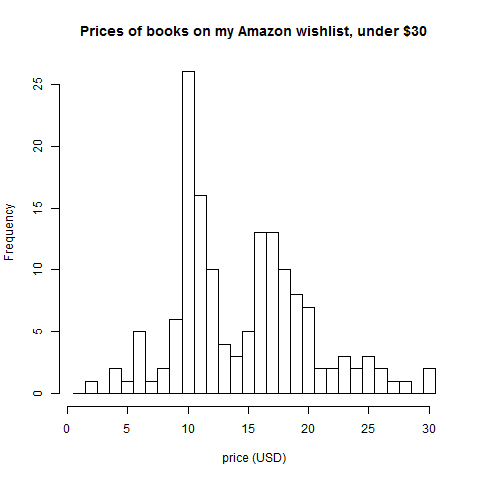 This is a much less depressing example than my standard example of a bimodal distribution, salaries of first-year lawyers. 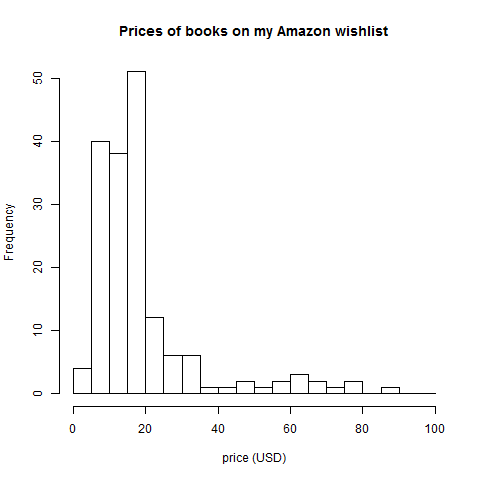 The existence of price points certainly validates the choice of a multi-modal distribution. But it looks more like a multi-modal modulated by an exponential decay that depends on ones perception of a cost / benefit relationship which can further be affected by other phenomena as well (See for example the framing effect).